We're so busy with hacking that forgot about our birthday. One year ago, on Feb 12, 2013, we produced our first noise and started receiving HTTP requests from the external world. We have been just a LaTeX editor throughout this year, but we have always been dreaming about space invasion something bigger. In our latest update, Papeeria v20, we do the first steps towards enhancing our borders. Experiments and results representation is arguably the most important part of scientific work. The world is waiting for a picture or a graph where a curve with your results looks better than other curves. There are rich and interesting ways of building plots in LaTeX, but many people may not have time or will to learn them, and just insert graphs from Excel. then we automatically create a histogram plot as PDF image next то your source file. You can use standard LaTeX ways to insert image into your document. Look at the result in our demo project or test plots in your own project by using "Simple line chart or histogram" template. At the moment being we don't provide any tuning capabilities. It is histogram only, you can't choose colors or fonts and so on. But stay tuned, it is just the first step. By the way, about images and figures. When you need a figure in your document, you need to type a few lines of code and if you're using online editor, upload image file to the server. Now you can use Figure assistant which shows up on hitting Ctrl+I in the editor. It uploads image file and then inserts figure environment and include \includegraphics and \caption commands. 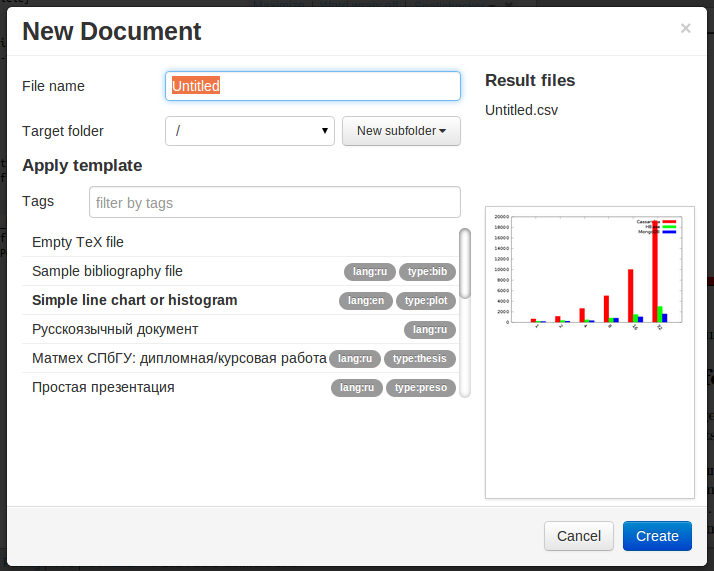 If you have played with plots already you may have noticed that PDF file appears in the project pane automatically. No refresh required. We're working on real-time collaboration and this important part is already public: now we instantly send project structure updates to all project collaborators. If Bob creates a new file, it appears in Alice's workspace instantly, and should Alice rename a folder, Bob will see the changes automatically. We have fixed a few bugs with mobile version and with cached compile results. In particular, if you compile project with pdfLaTeX, we will remember it and will automatically choose this engine wherever you use Papeeria.